Covers all the major topics in electricity. 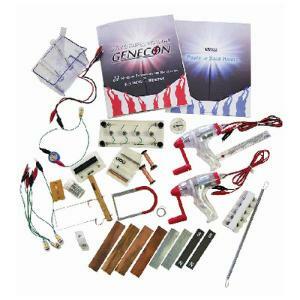 Your students will get a “charge” out of this kit! Includes two Genecons and 44 accessories which allow students to experience such phenomena as energy transformations, series and parallel circuits, electromagnetism, the motor effect, electrolysis of water, electroplating, wet cells, short circuits and fuses and storage cells.